We have a Baptism Team who organise Baptism in our Parish. 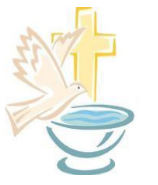 Baptisms take place on the 2nd Sunday of every month after the 11.30am Mass. There is a preparation meeting beforehand and this lasts for one hour and takes place in the week of the Baptism. You can download the booking form by clicking the below link or also request one from the Parish Office. NOTE: You must bring a copy of your child’s Civil Birth Certificate along with the completed booking form before any date can be set for the Baptism. Also, at least one month’s notice must be given to the Parish Office to confirm availability on the date required as there are limited places available each month.